Tripoli — LIBYAN authorities are under criticism for the continued insistence on detaining hundreds of refugees and migrants rescued from the Mediterranean Sea during failed attempts to reach Europe. The latest outcry follows the death of a dozen people after a rubber boat which spent more than 10 days at sea capsized off Misrata. Ten survivors were rescued and returned to Libya but three other passengers remained missing at the time of publication. Humanitarian groups however lamented that Libyan authorities moved six other survivors to detention centres. 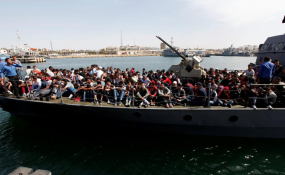 "We continue to advocate for alternatives to detention for migrants returned to Libyan shores, specifically for those most vulnerable," said Othman Belbeisi Libya Chief of Mission at the International Organisation for Migration (IOM). He also expressed concern about the lack of search and rescue capacity as the weather worsened with the onset of winter in Europe. "There are more possibilities to die at sea now than one year ago. This is not acceptable. Saving lives at sea should be the number one priority, and search and rescue operations clearly need to be reinforced." Dr Mohamed Abughalia, IOM physician, said survivors from the latest shipwreck were all suffering from complete dehydration and exhaustion after being stranded at sea for days. "People suffered from trauma, severe malnutrition and burns sustained from the boat's engine fuel," Abughalia said. Libya, destabilized by years of civil strife, remains the gateway to Europe for mostly African migrants seeking better economic prospects.